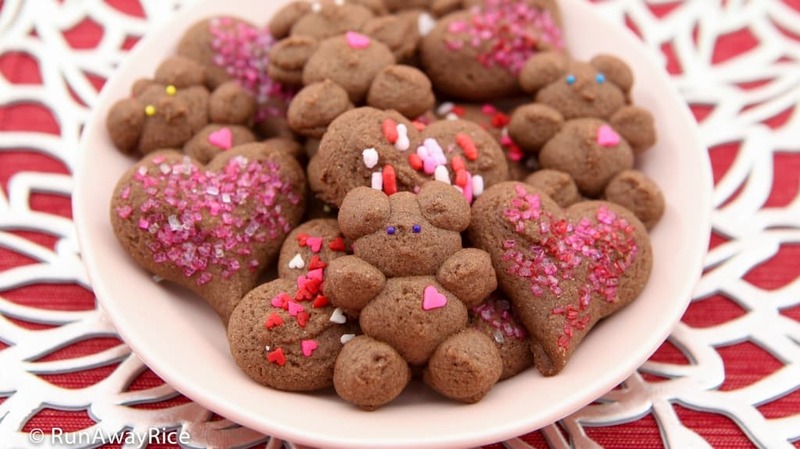 Chocolate Shortbread Cookies - Valentine's Day Recipe with Video! This easy Chocolate Shortbread Cookies recipe makes the tastiest decorated cookies. Valentine’s Day is just around the corner and what better way to shower your loved ones with affection than by making them a homemade sweet treat. These Chocolate Shortbread Cookies are fail-proof–just a few simple ingredients and super easy steps. 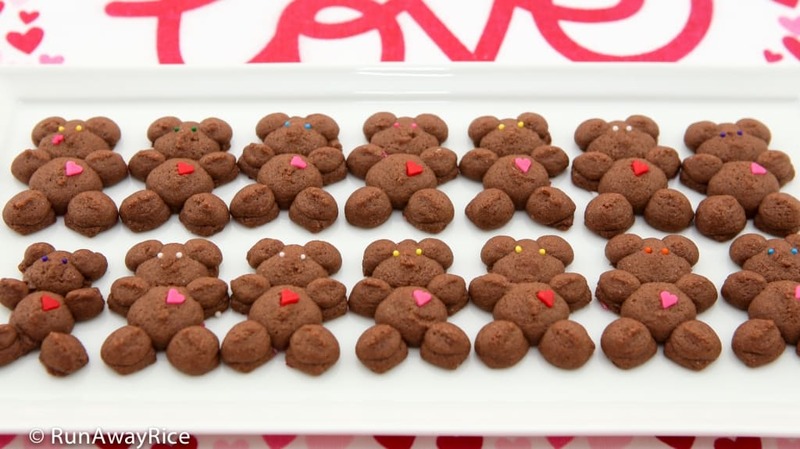 To shape the cookies, I am using the Oxo Cookie Press to make teddy bear and heart cookies. They’re so cute! Decorate the cookies with candy hearts, sprinkles and colorful sanding sugar and they are almost too cute to eat! 🙂 Everyone will adore these cookies. They are chocolaty, crispy and perfectly sweet. Enjoy! 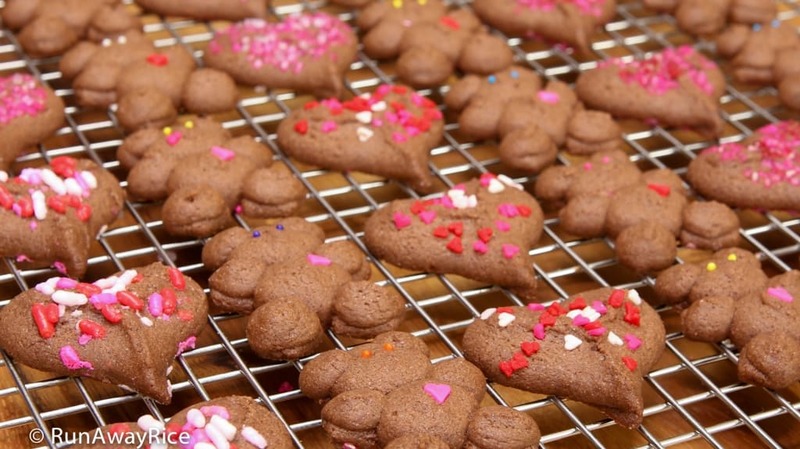 Enjoy this wonderful recipe even if you don’t have a cookie press. Simply roll the cookie dough into small balls and then flatten with a spatula or spoon. Alternatively, roll the dough into a log and cut into thin slices. If the dough is too soft, refrigerate for about 15 minutes and it’ll be easier to cut. Adjust the baking time accordingly for larger-sized cookies. Store the Chocolate Shortbread Cookies in an air-tight container and enjoy within the week. Refrigerate for up to 3 weeks. In a medium measuring cup, combine the all-purpose flour and unsweetened cocoa powder. In a large mixing bowl, add the sugar, salt and butter. Using a flat beater and on Medium Low speed, cream together the ingredients until light and fluffy, approximately 2 minutes. On Low speed, add the egg and vanilla extract. Beat until incorporated, approximately 30 seconds. 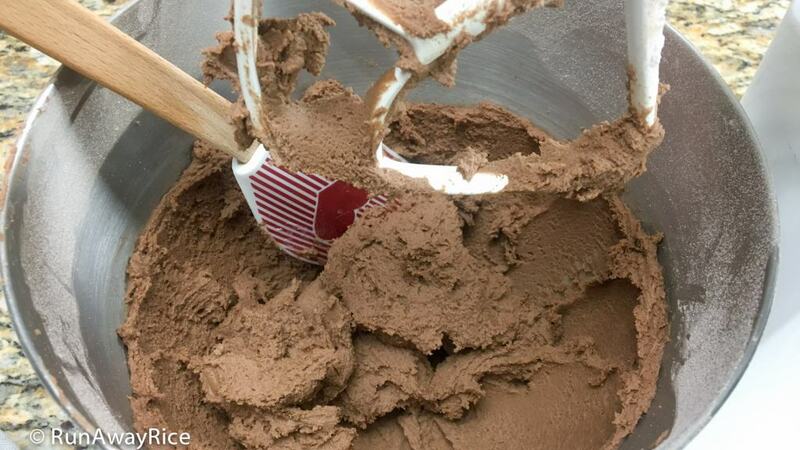 Gradually add the flour/cocoa powder mixture while beating continuously. Mix until well incorporated (dry flour is no longer visible), approximately 2-3 minutes. Insert the desired decorative disk and attach the ring to the barrel of the cookie press. Transfer some dough into the barrel. Pack the dough eliminating any large gaps. Twist on the top. Press the dough onto an ungreased baking sheet making the desired number of cookies. Swap out the disk and make cookies in other shapes. Decorate the cookies with assorted sprinkles, nonpareils and sanding sugar. Bake for 8-10 minutes or until the cookies are golden on the edges. Rotate the baking sheet halfway through the baking time for even browning. 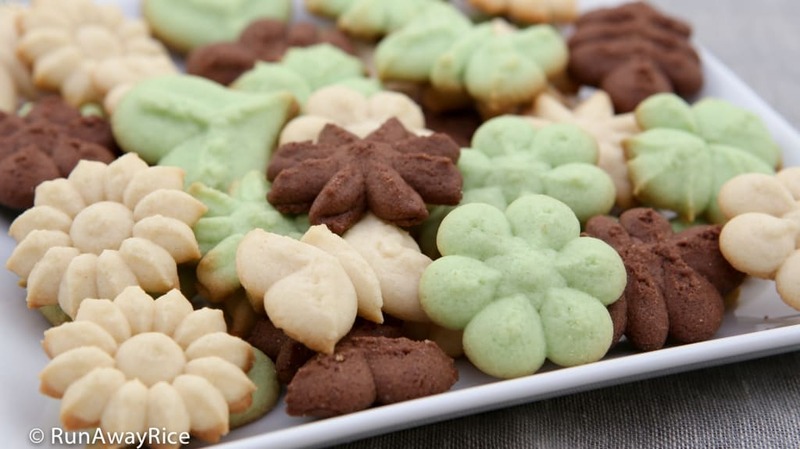 This easy Chocolate Shortbread Cookies recipe makes the tastiest decorated cookies. Valentine's Day is just around the corner and what better way to shower your loved ones with affection than by making them a homemade sweet treat. These Chocolate Shortbread Cookies are fail-proof--just a few simple ingredients and super easy steps. 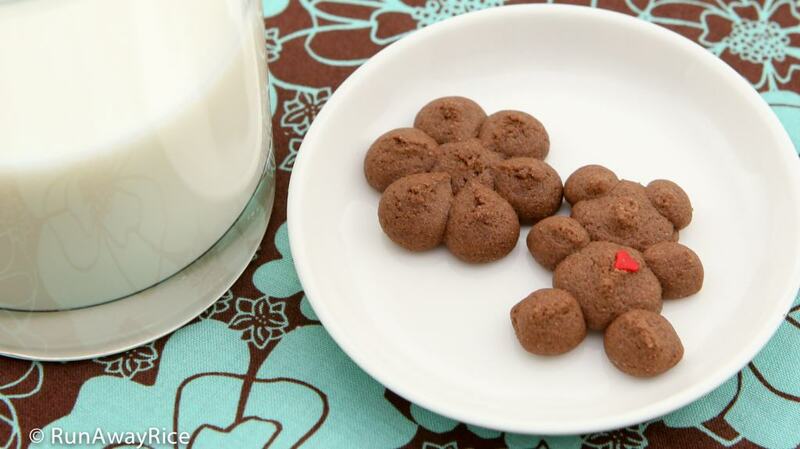 To shape the cookies, I am using the Oxo Cookie Press to make teddy bear and heart cookies. (They're so cute!) Decorate the cookies with candy hearts, sprinkles and colorful sanding sugar and they are almost too cute to eat! Well almost 🙂 Everyone will adore these cookies. They are chocolaty, crispy and perfectly sweet. Enjoy! 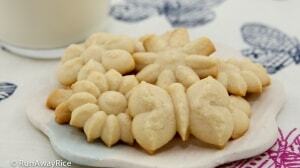 Enjoy this wonderful recipe even if you don’t have a cookie press. Simply roll the cookie dough into small balls and then flatten with a spatula or spoon. Alternatively, roll the dough into a log and cut into thin slices. If the dough is too soft, refrigerate for about 15 minutes and it'll be easier to cut. Adjust the baking time accordingly for larger-sized cookies. This recipe can be easily double, tripled, etc. to make more cookies. 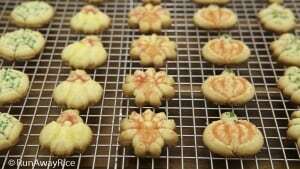 The recipe yields approximately 6 dozen (72) cookies. This may seem like a lot, but the cookies are bite-sized and so yummy, they’ll go fast! These are really yummy cookies. 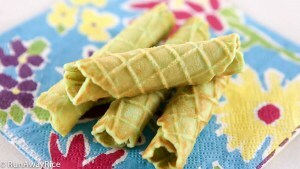 I made them in vanilla, Pandan and chocolate for my family. They really loved them!